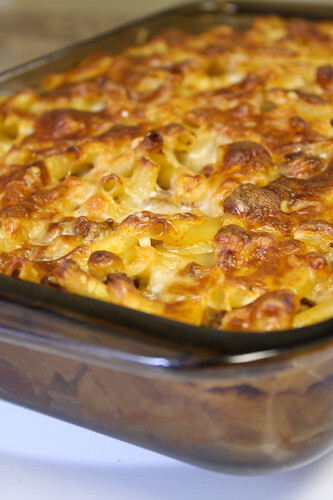 Baked Ziti is one of those “comfort food” type dishes for me that when I make this for dinner, I can literally eat this all day long! I personally like my cheese baked a little longer creating that delicious smoked-type cheese flavor. Not to mention the top layer of crispy noodles that result as an innocent by-product. If you are an “edge” eater, I highly recommend letting it hang out a little longer in the oven. 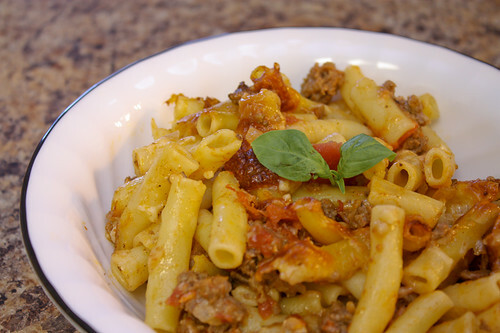 Omitted salt from the sauce as well as when cooking the ziti noodles since the mozzarella and Parmesan cheese are plenty flavor for this dish and the canned tomatoes have a decent amount of salt already. The best thing about this dish is that my 4- and 2- year old ate their plates clean! Well, aside from Big K who left the tomatoes to congregate, but when resistance is minimal during any meal, I’ll take it! This is an all-time favorite with Hubbo. Bring a large pot of water to a boil, salt generously, and boil the pasta until al dente, tender but still slightly firm. Drain. Toss the cooked pasta with the marinara sauce, cubed mozzarella, half the Parmesan cheese, black pepper, and pepper flakes. Transfer the pasta to an oiled 9 by 13-inch baking dish. Cover the top of the pasta with the sliced mozzarella, and sprinkle with the remaining Parmesan. Bake until lightly browned and hot, about 30 minutes. Serve immediately. Heat the oil in a medium saucepan over medium-high heat. Cook the sausage/ground beef until beginning to brown, about 3 minutes. Add the onion and garlic, stirring, until lightly browned, about 3 minutes more. Add the tomatoes and the herb sprigs and bring to a boil. Lower the heat and simmer, covered, for 10 minutes. Remove and discard the herb sprigs. Stir in the salt and season with pepper, to taste. Use now or store covered in the refrigerator for up to 3 days, or freeze for up to 2 months. Mmmm…we will make this very soon especially for the crunchy top!